The Samsung Corby series is top selling entry level touch screen mobile range in India and several other world countries. However the touch and browsing in Samsung Corby not so impressive as you might think. Overall there was the need of a good mobile operating system. Today Samsung announced their first Corby series phone with Androd OS. 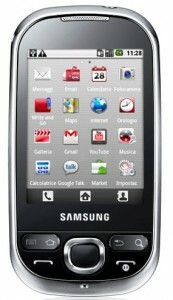 The new Samsung i5500 Corby (Also known as Galaxy 5) packs latest Android 2.1 Eclair release and it is expected to get an upgrade to Froyo. Samsung Galaxy 5 has similar design and size of the very basic S3650 Corby, but the internal specifications are somewhat different. First Introduced with the Google Nexus one, the Android 2.1 is currently being used by HTC Desire, Samsung Galaxy S, Motorola Milestone and several other high profiles handsets. Google introduced a new device and browser UI, HTML 5 support, live wallpapers, Bluetooth 2.1, digital zoom, multi-touch (in supported handsets) all in Android 2.1 Eclair. You are getting all those features in low cost Samsung Galaxy 5 Android smartphone. The home screen UI of Samsung i5500 Corby is just like any other non-customized Android 2.1 smartphone. It has a 600MHz processor and capacitive touch screen. So the touch should be very smooth and responsive. Equipped with high speed 3G with HSDPA, Samsung i5500 Corby includes all other necessities of a smartphone. There is WiFi, GPS, Bluetooth, access to 30000+ strong Android market place, 2Mp camera, microUSB, 100 MB internal memory, device storage expansion slot and 3.5 mm headphone jack. Samsung i5500 Corby also has a 1200 mAh battery, with which you can expect a good backup time. Samsung introduced Samsung i5500 Corby Android in Italy. This month they would the launch device in India and rest of the world. The expected market price of Samsung Corby Android in India is 11200INR (230USD). Samsung Corby Android has has capacitive screen and multi-touch*. So you can expect good web and photo viewing experience. Nokia C6 is also a good option with 5MP camera and QWERTY keypad.